KENOSHA, Wis. (WLS) -- Roundy's Supermarkets is recalling more than 16,000 lbs. of chili and soup they said may be contaminated with foreign matter, specifically hard plastic. The US Department of Agriculture's Food Safety and Inspection Service issued the recall Tuesday. 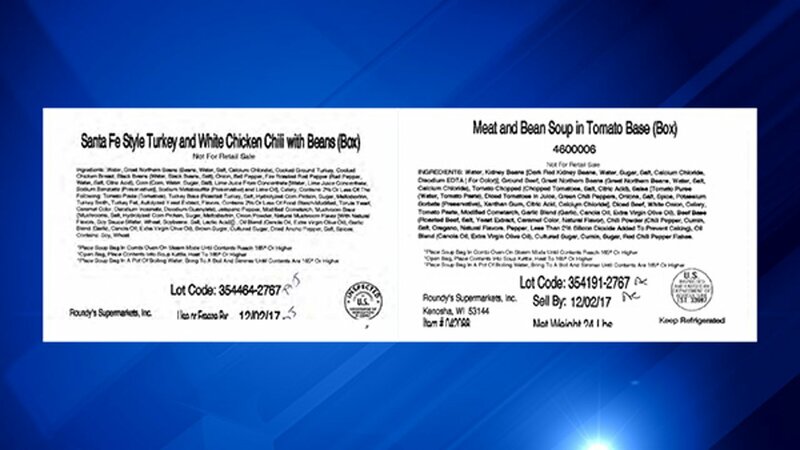 The affected products are Ready-to-Eat chili and soup that was produced and packaged on Oct. 3, 2017, with a Sell-By date of Dec. 2, 2017. Roundy's is recalling 24 lb. boxes containing six 4 lb. bags of "Meat and Bean Soup in Tomato Base" with lot code 354191-2767 and 24 lb. boxes containing six 4 lb. bags of "Santa Fe Style Turkey and White Chicken Chili with Beans" with lot code 354464-2767. The affected products have establishment number "EST. 33997" or "P-33997" inside the USDA mark of inspection, and were shipped to retail stores in Illinois and Wisconsin. They are sold to be prepared for supermarkets' soup bar rea. The problem was discovered Monday, and the FSIS was notified Tuesday. No reports of adverse reactions after consumption have been reported. Recalled products should be thrown away or returned to the place of purchase. Consumers with questions about the recall can contact Roundy's Customer Service Center at 1-866-768-6397.